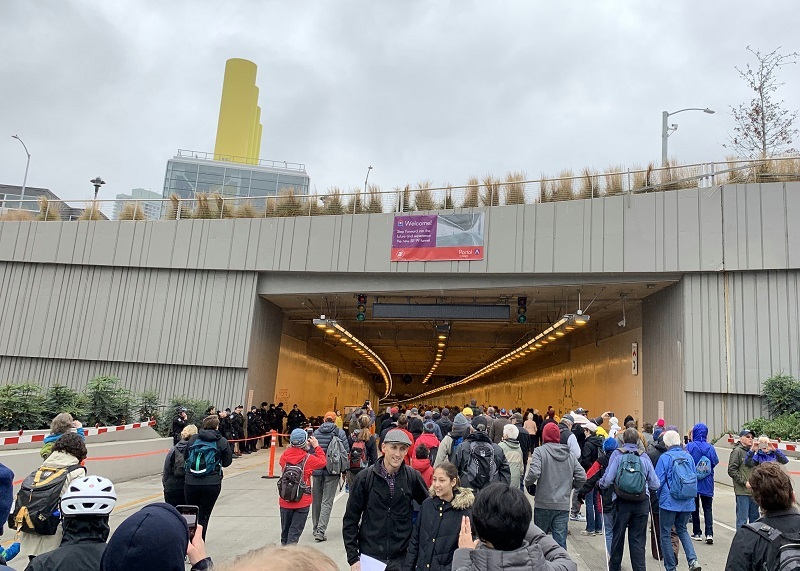 Washington’s new State Route 99 tunnel was officially opened by Governor Jay Inslee today at 11 am. Shortly after that, the public was allowed to walk through it. (Earlier in the morning there was a fun run through the tunnel). 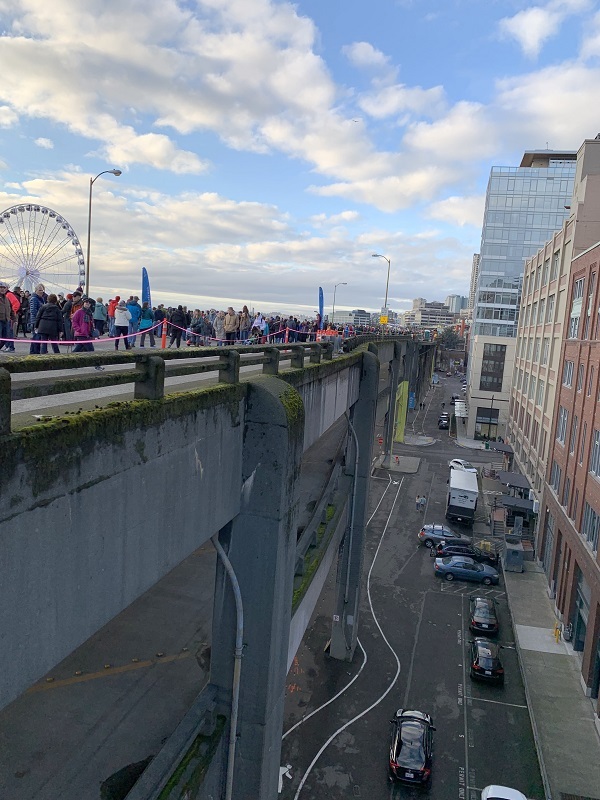 The public was also allowed to bid a final farewell to the Alaskan Way Viaduct. After this weekend, its demolition will start in earnest. Drone video from WA Dept. of Transportation, shot at about 8 am this morning when the fun run started. 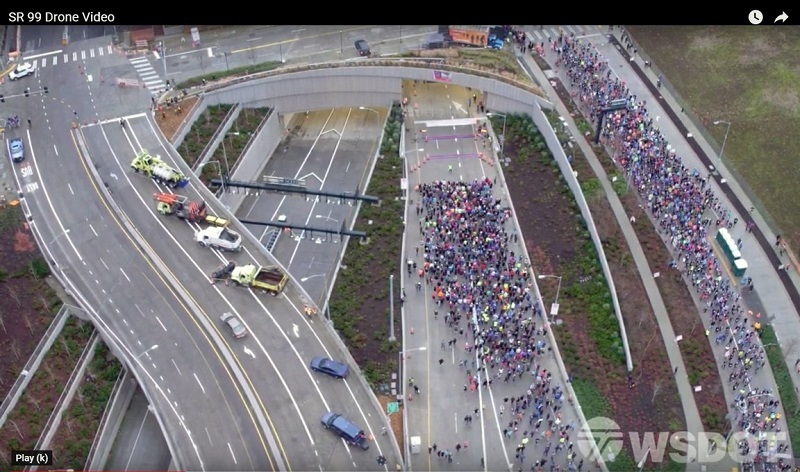 The entrance to the southbound deck where the runners are assembling is on top, and to its left and lower down, is the northbound deck. (Inside the tunnel the decks are stacked on top of each other). The north entrance to the southbound deck. A Space Needle glimpse is visible at the top left, and the building with the yellow chimneys house the tunnel ventilation equipment. Just getting started, so two miles (3.2 km) to go! The top of the tunnel is still flat here (the top part of the picture) – so this ‘cut and cover’ section was done without the tunnel boring machine’s excavation. A little further in, the rounded ceiling shows the tunnel boring machine was at work. 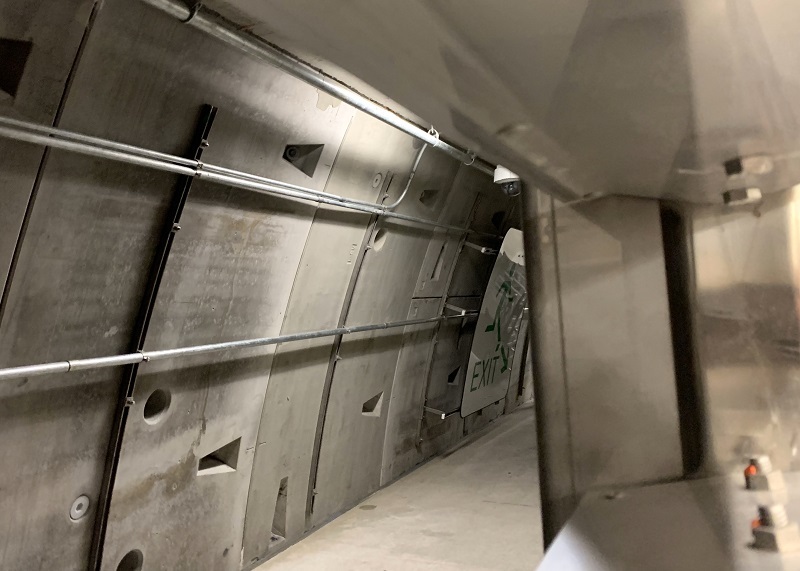 Every 600 ft (200m) or so, there are emergency exit doors that lead into an escape tunnel, that will allow people trapped in the main tunnel, to escape from hazardous conditions. 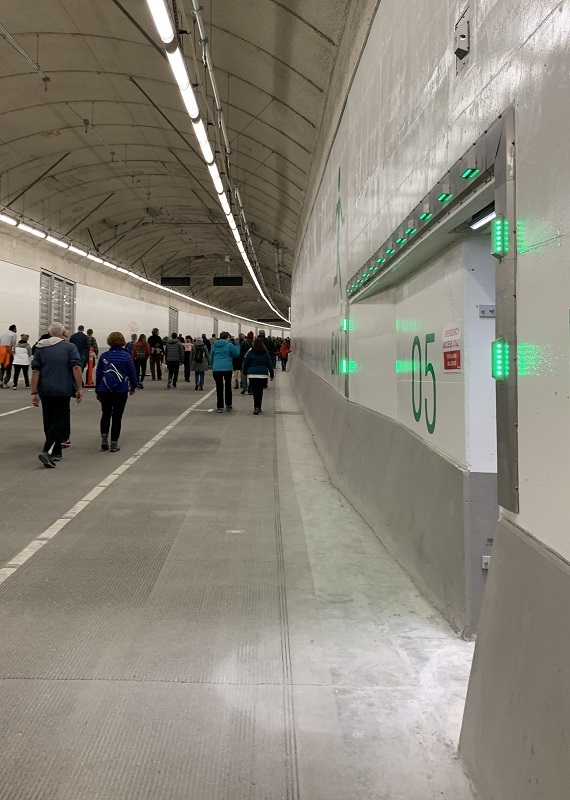 Here is a peek of the emergency escape tunnel that runs along the main tunnel. (I stuck my phone camera into a ventilation grill opening). Those cement rings with the round and triangular recesses for bolts, were laid down as the boring machine chewed its way through the earth to create the tunnel. There is a gentle slope down, and then a slope up again to get out of the tunnel. 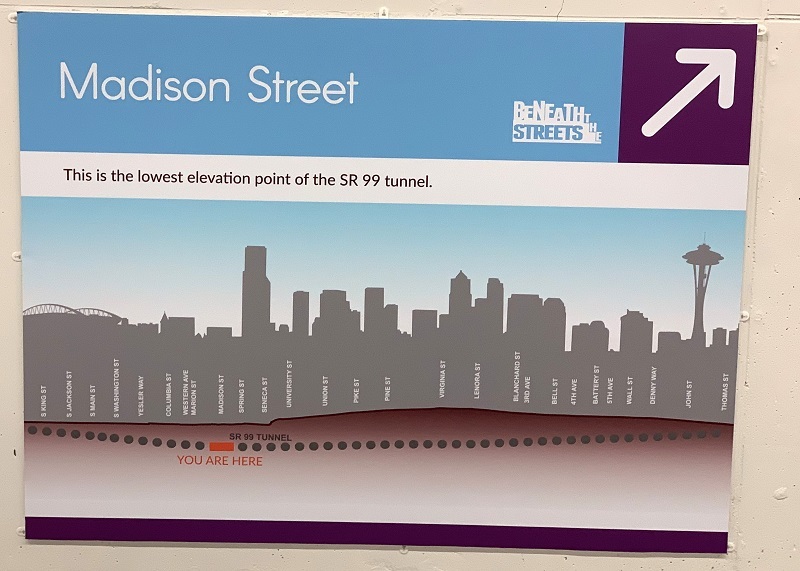 The tunnel had to be deep enough in places to clear existing sewage tunnels and the light rail train tunnel. 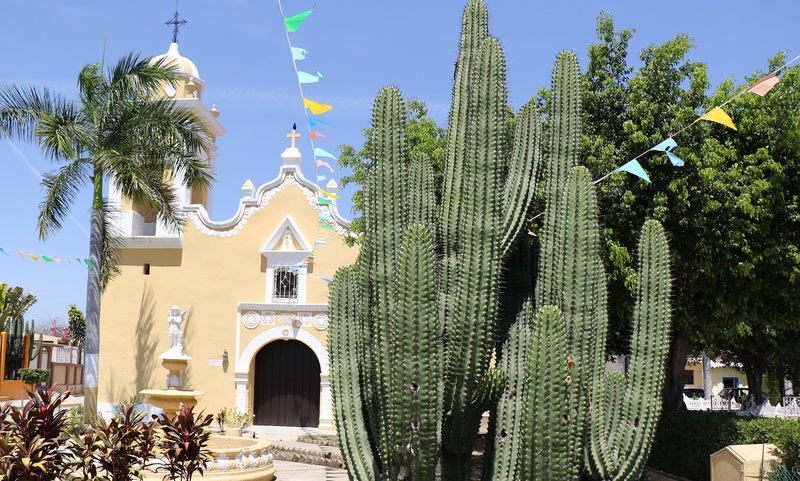 Here at its lowest elevation, the tunnel crown is at 95 ft (29 m) below sea level. A little further north, it is 215 ft (65 m) deep at its greatest depth below ground. Alright! Ahead is the ‘light at the end of the tunnel’. We’re about to exit on the south end by the sport stadiums. 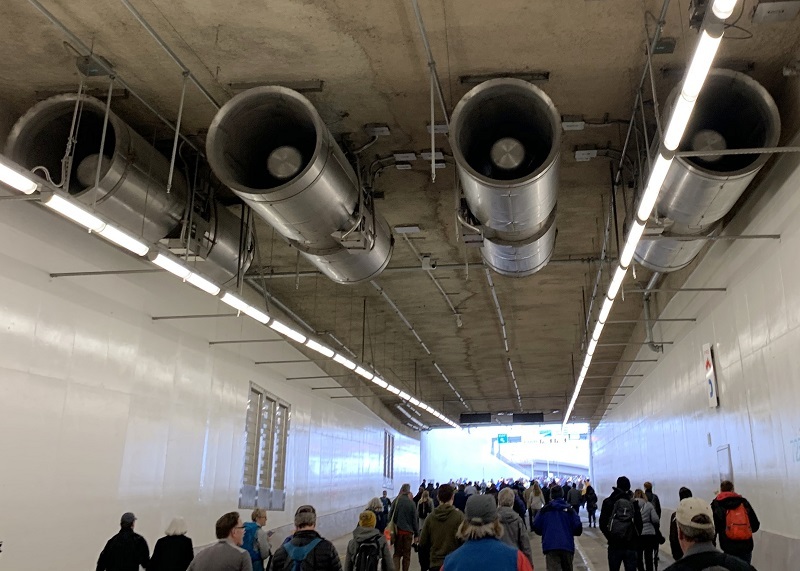 Those giant tubular fans are for creating a draft along the main tunnel when traffic is stuck inside (in a traffic jam). 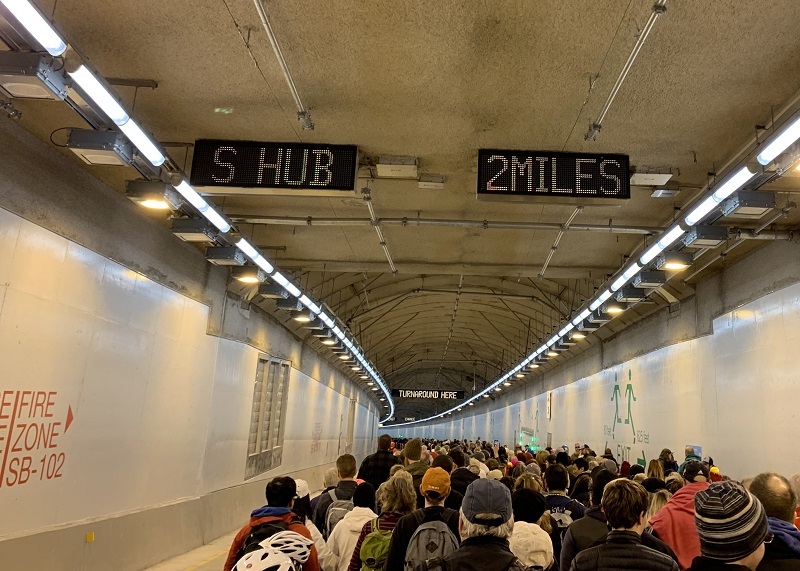 The fans are not needed when traffic is flowing and thereby creating a draft in the tunnel. Looking back at downtown Seattle after we had walked underneath it. This is the exit of the southbound part of the tunnel. 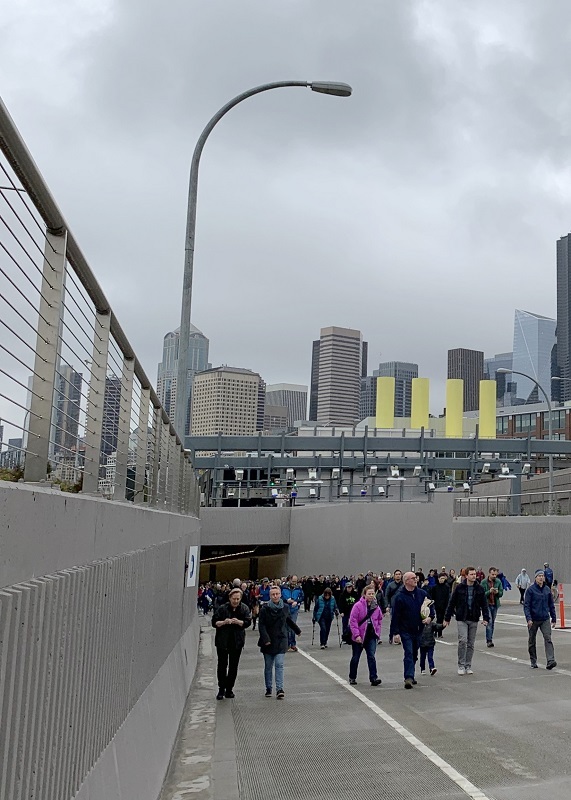 Today a final opportunity was offered for the public to walk around on the Alaskan Way Viaduct. Its demolition will start in the next week or so. This is the view looking south from Pike Place market. 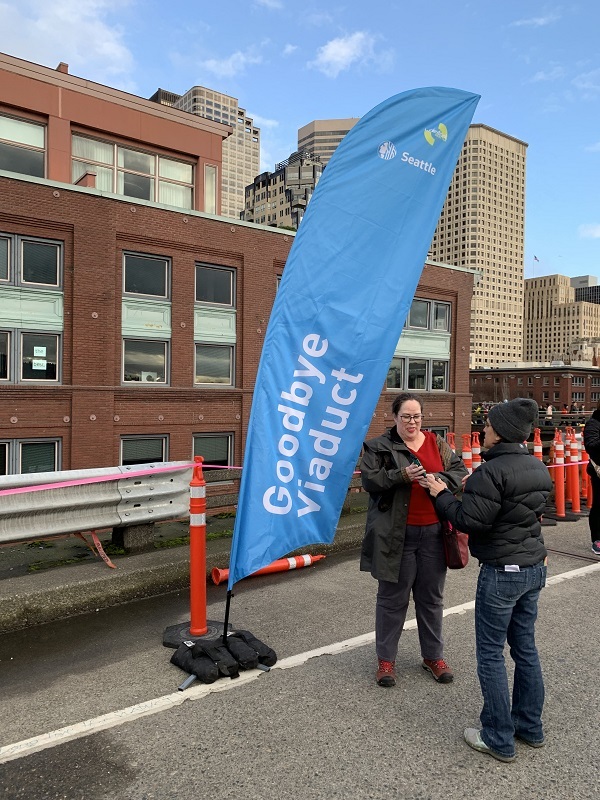 Goodbye Viaduct! ‘Hello Waterfront’, said a similar banner on the other side. 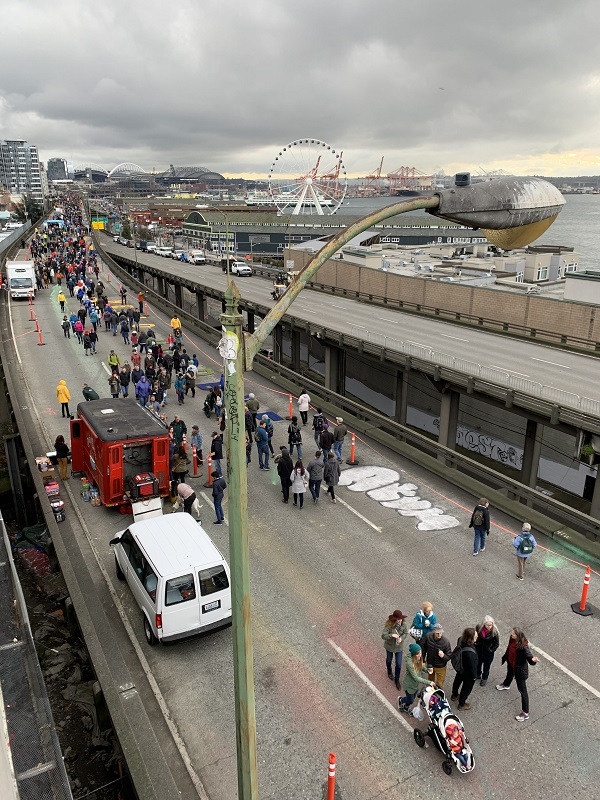 Here’s a final view of the Alaskan Viaduct structure from the Seneca Street exit.